How do you go foundationless? You mean I can just put a box of empty frames on the hive? What is a comb guide? Which comb guide do you like best? Do I need wire in them? Can I use wire in them? Can I put a whole box of foundationless frames on a hive? Won't the bees mess it up without foundation? Won't it set the bees back having to build their own comb? Is it a good idea for a beginner to use foundationless? What if they mess it all up? Won't they just build drone comb? Why would one want to go foundationless? How about no chemical contamination of the combs and natural Varroa control from natural cell size? As far as contamination, some of my queens are three years old and laying well. I don't think you'll find anyone who is using chemicals in their hives with that kind of longevity and health in their queens. You can also get clean wax combs with natural cells in a top bar hive. Bees need some kind of guide to get them to draw straight comb. Any beekeeper has seen them skip the foundation and build combs between or out from the face of the comb, so we know that sometimes they ignore those clues. But a simple clue like a beveled top bar or a strip of wax or wood or even a drawn comb on each side of an empty frame will work most of the time. You can just break out the wedge on a top bar, turn it sideways and glue and nail it on to make a guide. Or put Popsicle sticks or paint sticks in the groove. Or just cut out the old comb in a drawn wax comb and leave a row at the top or all the way around. The main thing is that there is an edge that protrudes, preferably at least 1/4". Waxing wood guides is not only not necessary but I don't recommend it. The wax you put on won't be attached as well as the bees will attach it. I made these by ordering frames from Walter T. Kelley with no grooves in the top and bottom bars and cutting the top bars at a 45 degree angle on both sides. The bees tend to follow the sloped top bar. L.L. Langstroth has pictures of this design in the original "Langstroth's Hive and the Honey Bee" which you can still buy as a reprint. 3rd from the left, drawn foundationless frame. Note the corners are often open, the bottom seems to be the last to get attached, but this is attached on all four sides and ready to be uncapped and extracted. 4th from left, here is a Dadant Deep foundationless with a comb guide all the way around and a 1/16" (1.6mm) steel rod for support horizontally in the center. This allows cutting six pieces of 4" by 4" comb honey out without fighting with wires. Langstroth also used the comb guides on the side like this. Last three. Page from LL. 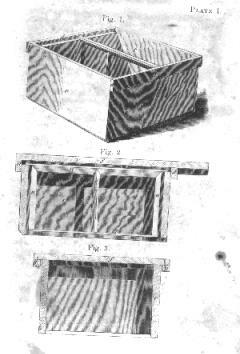 Langstroth's Hive and the Honey Bee and close ups of the original foundationless frames and the "comb guide." In my experience the bees will draw their own comb faster than they will draw foundation. I'm not the only one to make the observation that bees are not attracted to foundation. Most of these can be found online in Cornell's Hive and the Honey Bee collection. No. The bees need some kind of guide. It can be any of several things. You can use an empty frame with nothing added if you have a drawn brood comb on each side as the brood comb will act as a guide. You can put popsicle sticks in the groove to make a sort of wooden strip, or cut a piece of wood to make a wood starter strip. You can turn the wedge on end and glue it in. You can cut a triangular piece and put on the bottom of the top bar. You can buy chamfer molding and cut it to fit and put it on the bottom of the top bar. You can cut the top bars on a bevel. You can make a sheet of empty wax and cut it into 3/4" (19mm) wide strips and put in the groove of the top bar and wax it in. You can cut strips of regular foundation into 3/4" (19mm) wide strips and wax that in the groove or nail it with the cleat. If the frame already had comb in it, you can just leave the top row of cells on the top bar for a guide. Any of these work fine. I'll start with what I like the least. A wax bead in a groove is almost no guide at all. In order to be effective a guide needs to protrude at least 1/4" (6mm). Other than that I like all of them fine, but I like the durability of the beveled top bar and I think the comb is attached a bit better. Next I'd probably go for the wood strip. Last I'd go for the starter strips as they sometimes get hot and fall out if the bees haven't used them yet. But I also feed empty frames into brood nests all the time as I have a lot of old frames around. Bottom line is, I do whatever is the easiest at the time. Yes. I extract them all the time. Just make sure they are attached on all four sides and the wax isn't so new that it's still soft, like putty. Once the wax is mature and the comb is attached at least some on all four sides, it extracts fine. Of course you should always be gentle with any wax combs (wired or not) when extracting. I don't use wire but I don't use deeps either. Sure. The bees will incorporate the wire into the comb. Of course you need the hive level anyway, but this becomes more obvious with wire in the comb. Wire is probably more useful when doing deeps than mediums. I run all mediums. Assuming we mean frames with comb guides, yes, you can. Usually this works fine. Sometimes because of a lack of a comb to use as a "ladder" to get up to the top bars, the bees start building comb up from the bottom bar. For this reason I prefer to have one frame of drawn comb or a full sheet of foundation in a super being added on. This isn't a problem when installing a package. Another reason for the one comb, though, is it's good insurance at getting the combs in the right direction. Another solution to them trying to build comb up, is to put the empty box under the current box so they can work down. Sometimes. But they mess it up sometimes even with wax and even more often with plastic. I've seen no more bad combs doing foundationless than I have using plastic foundation. Some of this appears to be genetic as some hives build good comb even when you do everything wrong. Other hives build messed up comb even when you do everything right and simply repeat the "mistakes" when you remove them. The most important thing to grasp with any natural comb hive is that one good comb leads to another in the same way that one bad comb leads to another. You cannot afford to not be paying attention to how they start off. The most common cause of a mess of comb is leaving the queen cage in as they always start the first comb from that and then the mess begins. I can't believe how many people want to "play it safe" and hang the queen cage. They obviously can't grasp that it is almost a guarantee of failure to get the first comb started right, which without intervention is guaranteed to mean every comb in the hive will be messed up. Once you have a mess the most important thing is to make sure the last comb is straight as this is always the guide for the next comb. You can't take a "hopeful" view that the bees will get back on track. They will not. You have to put them back on track. This has nothing to do with wires or no wires. Nothing to do with frames or no frames. It has to do with the last comb being straight. In my experience, and many others who have tried it as well, the bees build their own comb much more quickly than they build on foundation. Using foundation sets them back in many ways. First they draw foundation more slowly. Second, the foundation is all contaminated with fluvalinate and coumaphos. Third, unless you're using small cell foundation, you're giving them cells that are larger than they want and giving the advantage to the Varroa. In the earlier G.M. Doolittle quote he makes it clear he believes there is no advantage in this regard to using foundation. In my opinion it's easier for the beginner who has no habits to adjust to foundationless. It's much more difficult for the seasoned beekeeper to adjust to keeping hives perfectly level, not turning comb flatways, not shaking bees vigorously off of a comb that's still new and not well attached etc. Beginners will often break one comb and learn their lesson. Experienced beekeepers will keep falling back into habits and breaking combs for a while until they finally get it ingrained as a new habit. This necessity of handling new combs differently is not unique to foundationless. Hopkins was talking about combs using wax foundation. Foundationless increases the likelyhood. It's doubtful but possible that they will. I've seen this occur more often when a box full of frames with wax foundation collapses in the heat. I suppose this seems much more frightening to someone who has never done a cutout. If you've ever cut all the combs out of a wild hive and tied them into frames, then you already know what to do. 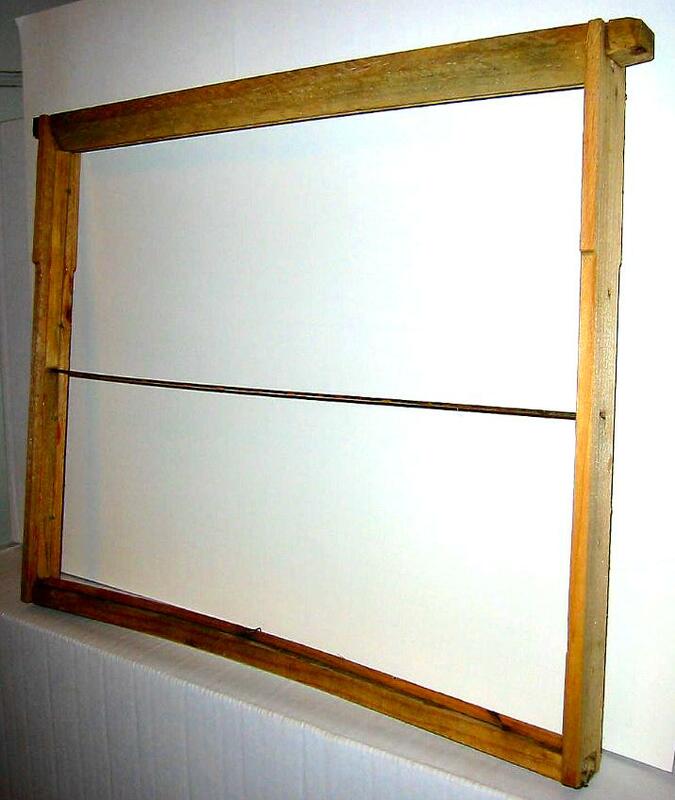 You cut the wild combs and you put them in an empty frame and use rubber bands or string to hold them in the frame. The bees will take care of the rest. They do this just as often with plastic foundation and it's often more difficult to fix. If I make my own what dimensions should they be? You can make them out of standard frames, but I do prefer them with smaller end bars and slightly smaller top bars. See the frame width page. Won’t they just build drone comb? Only the first frame or two. Bees have a threshold for drones that varies depending on resources and time of year. They will go to a lot of effort to reach that threshold. Drones get a bad rap. They are accused of being lazy. They leave the hive every afternoon and fly until they are exhausted. Their lives are just as short because they work just as hard as the foragers. The only downside for the hive is that they don't produce honey, but they do work at perpetuating the species at great cost to themselves, even if they don't succeed and greater if they do. “...in the presence of male bees, the organism of workers works more effectively, i.e. it utilizes in a better way the components contained in food. It must be stressed that next to the high survival rate in the worker bees consuming carbohydrate food, there occurred also a better development of the pharyngeal glands where protein is particularly necessary. The presence of drones had also a positive effect on the content of total protein and crude fat in the bodies of worker bees consuming sugar candy.”* This study may change the minds of some beekeepers concerning the value of drones in a colony; their removal may not be as benign as once thought. “ Sanford, M.T. 2002, "Apimondia in South Africa," Bee Culture, Vol. 130 (seven installments: January, February, March, May, July, August, September).